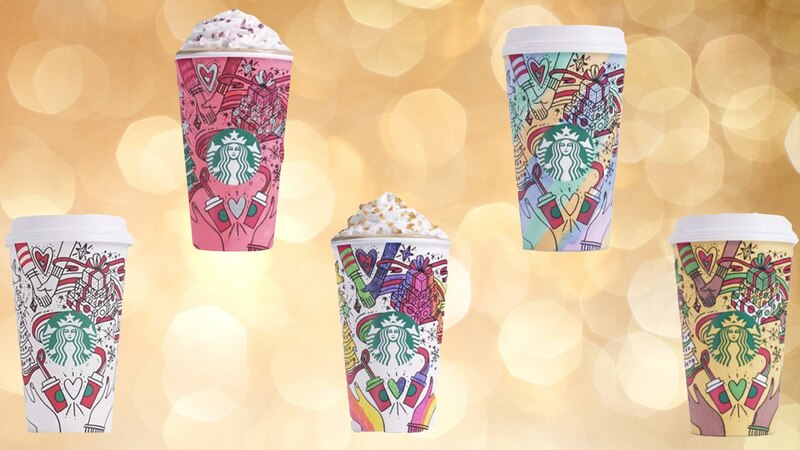 For those of us who plan our holiday shopping around the launch of Starbucks’ holiday lineup, we’d better get cracking on that list: The seasonal cups and menu are here! There’s a lot of news dropping at Starbucks today, including the launch this morning of the new cups in a fun new design and a return of seasonal-favorite menu items. Our classic menu favorites are making a comeback, but there are also some fun new items. Holiday cups! This year’s holiday cup is a coloring book format with a white background and the iconic green siren logo in the center. Beyond that are black sketch illustrations of Christmas trees, ornaments and mugs that we then get to color in ourselves. So, make that cup red if you want. It’s really up to you. This cup design may not come as a surprise to everyone though – a few weeks ago, the design was actually leaked on Reddit by someone who claimed to work for Starbucks. The post was later deleted, but turns out he was spot-on! As for the menu, favorite holiday drinks like the chestnut praline latte, caramel brûlée latte, gingerbread latte, eggnog latte, and peppermint mocha are all returning, as is the holiday-themed turkey and stuffing panini. As the annual red cup often leads to a lot of excitement — and backlash — it’ll be interesting to see how these changes are received.